A Cadillac dealership in Shanghai in Jan. 2017. The General Motors luxury brand now sells more light vehicles in China than the United States. 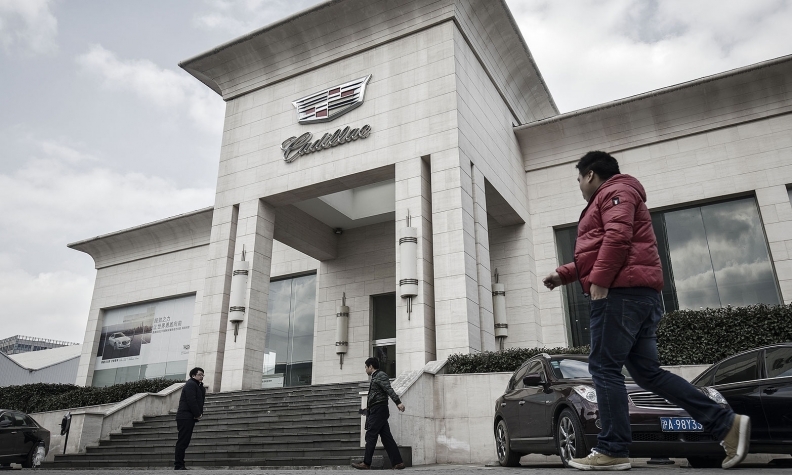 Significant growth in China propelled Cadillac to its second-highest annual sales tally in the brand's 115-year history. The General Motors luxury brand on Friday said it delivered 356,467 vehicles worldwide in 2017, a 16 percent increase over 2016. Cadillac's global sales peaked at 360,825 in 1978, with most of the volume in the U.S.
China, which overtook the U.S. as the brand's top market in 2017, led the way with a 51 percent increase in sales, to 175,489 vehicles, followed by a 10 percent increase in other international markets. In the U.S., volume dropped 8 percent to 156,440 units last year. "Our objective of rapidly establishing a second volume hub for the brand to complement our U.S. operations has been attained, as our Chinese business grew exponentially, leaving us well-positioned for sustained growth going forward," Cadillac President Johan de Nysschen said in a statement. Cadillac, the top-selling luxury brand in the U.S. for years, through 1997, has been overshadowed by Mercedes, BMW, Audi and Lexus in recent years. The three German luxury brands each now sell over 1 million light vehicles a year worldwide. De Nysschen told Automotive News last year that he originally anticipated China would overtake the U.S. as Cadillac's top market by 2019; however, the country's luxury market has grown quicker than expected. "It was imperative to get the China business running so that we could get the cars to be more forceful of a player in the United States," he said in September. Cadillac's U.S. sales have dropped three of the last four years in part because the brand has been slow to adapt to consumer preferences for crossovers instead of cars, and de Nysschen's focus on business operations. "In the U.S., our focus on high-quality business has seen overall revenue growth being supported through higher transaction prices, while Cadillac residual values continue to strengthen, leaving us well positioned for 2018 and beyond, in preparation of our new product offensive starting with introduction of the XT4 later this year," de Nysschen said Friday. The XT5 crossover remains the brand's top-selling product, with 143,905 units delivered worldwide in 2017 -- accounting for 40 percent of Cadillac's total sales. A breakdown of its other models was not immediately available. GM's 2017 global sales are expected to be released when it reports fourth-quarter and year-end financial results on Feb. 6.